*swoon* I absolutley love old buildings-it's the downside of the rapid expansion movement that is AZ. The good news is I am headed for a Sedona road trip and my new issue of Somerset w/your feature is neatly tucked away for my viewing pleasure. Congratulations! 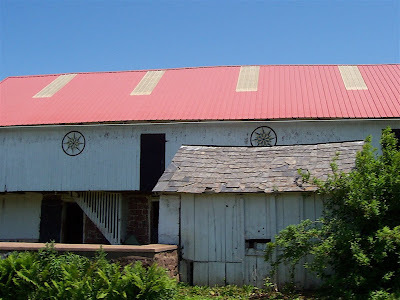 Seeing photos of barns is fun for me because I don't see them in my area. I adore the little windows in the second barn. My fave photo is the blue bird house. Adorable! When I read 'blue bird house' I was wondering why the house wasn't blue. Now I get it. It's for Blue Birds! Gotcha! 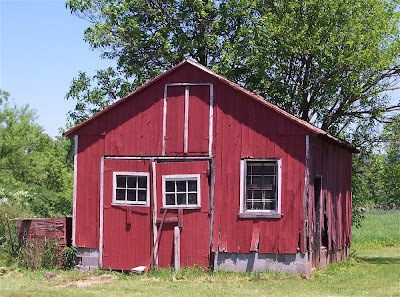 Lovely red barns - I am figuring I will see a lot of barns when we move to IL next month! Yay for Friday - lovely photos! Oh so pretty! I love that lush bird house! And that barn looks like it has an adventure inside! I love old barns like that, but from the outside. When I go in, I get all creeped out by spidery things! 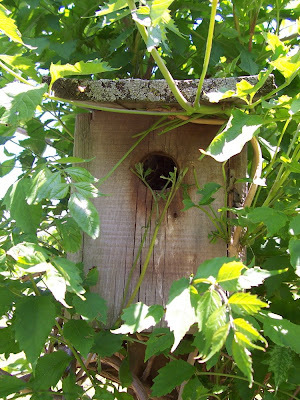 Do you still get dwellers in the bird house? You can never get tire of that. We have a steady stream of house finches that live in our bird houses, spring through summer. Right now there are some little babies inside this one that are getting ready to fly. We had hoped to have some bluebirds occupy the houses, but so far none have moved in, although they were actively looking inside them this year! We heard that they like their homes pretty well aged, and clean. We can no longer clean this particular house do to the trumpet vine. Still we get a real kick out of the finches, they are so cute when they peek their little heads out! I need to get a picture of that! Don't you live in a wonderful place? To Kill a Mockingbird country!